Coach Davide Ballardini, looking more Secret Service Agent than Serie A Coach, has now lasted longer than both of his predecessors combined, and that’s just the managers Cagliari has had this season. Of course, it is his 3rd time managing the club, and you know what they say about the 3rd time… Anyway, since we last met just before Christmas, Cagliari have impressed. They beat Genoa at home, 3-0, drew with Juve away, 1-1, and last week drew with Fiorentina 0-0 at home, although they were the better team that day, it was Boruc, Fiorentina’s superstar keeper that kept them off the scoresheet. Needless to say, they may not enjoy Ibra’s welcome and are undoubtedly planning to avenge the drenching wet 2-0 beating we gave them at home in December. Ballardini, like his fellow former Cagliari coach Massimiliano Allegri, prefers the 4-3-1-2. Against Fiorentina he fielded Agazzi in the net; Astori, Canini, Agostini, and Pisano in the back; Ekdal, Nanggolan, Dessena; Cossu; and Ibarbo and Larrivey up front. I am not aware of any suspensions or injuries, but that’s not saying anything. I have heard, though, that Juventus are in talks for Nainggolan, whether it be now or June. So if something is happening there, we may be spared his wrath… for now. Will the boy Pharoah get his chance to rule the pitch? Allegri probably mutters lineups in his sleep right now, with our injury crisis in full force, and our schedule he’s got to choose players very carefully. Not only do we have FIVE midfielders out injured (Merkel will be out for one month,) but we also have some potential suspensions based on card accumulation, too. Those one card away from suspension include: Antonini, Aquilani, Bonera, and Mesbah. Certainly, this month will show us if we truly have the depth we need to battle on 3 fronts. Sooo… Will Allegri play any of his shiny new toys? Will he give a start to the young Pharoah? Or will he give some gratuitous minutes to Pippo? Who exactly will he start, all things considered? In the words of Dr. Seuss, “I don’t know. 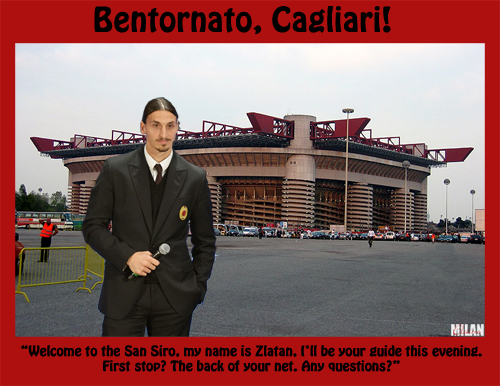 Go ask your Mom.” I will try to conjure a few ideas, though: Abbiati is said to be fit. If so, I say he starts in goal. In the back, Abate, Nesta, Silva, Mesbah. In the middle, Ambrosini, van Bommel, Nocerino, Robinho, with Ibra and El Shaarawy to start up front. Or Robinho. 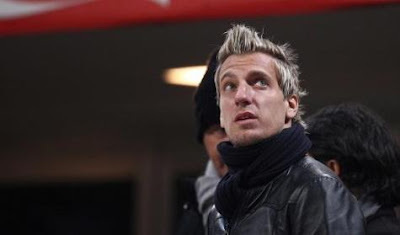 Or Maxi Lopez, although I’m guessing if he plays, it’ll be as a sub. Left Back Roulette was fun, but it's over. Mesbah for LB!! He came, he saw, he signed. Will he play, though? Welcome Maxi!! By virtue of their record, Cagliari have climbed a spot in the table to 11th since December, with 23 points, whereas we are in 2nd with 40 points, one point shy of unbeaten Juventus. It promises to be a good matchup, and one we need to win, but it may not be a walk in the park. However, given the challenges we face this next month, it is imperative that we take the points that are a little more attainable, lest we slip up when the going gets tough. Also to keep pace with Juve, who are playing Udinese tonight, weather permitting. Any loss of points for them and a win for us puts us back in the driver’s seat, leading the tour, just where I like to be.